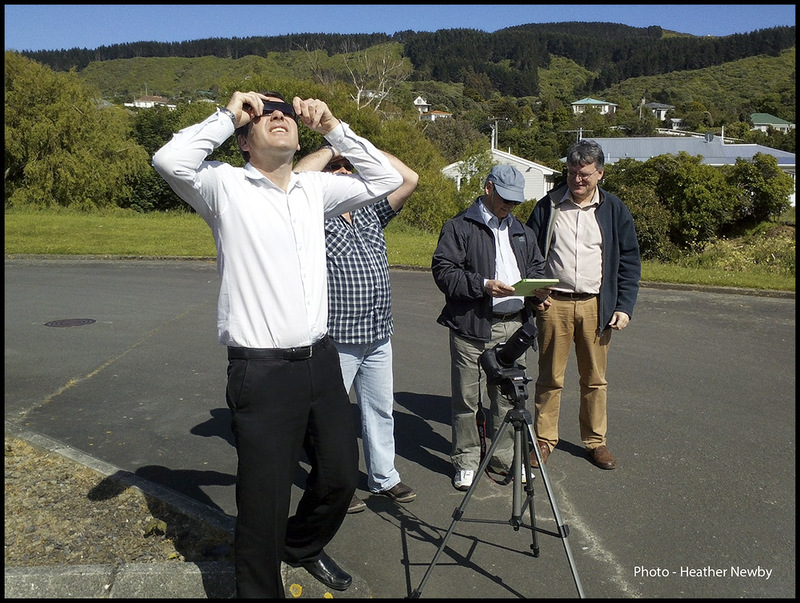 Man Behind Lens: Solar Eclipse Wows Wellingtonians! So can you imagine all the buzz around Wellington today? Wow! There is a FULL SOLAR ECLIPSE from 10 am! And at 1.30 pm Prince Charles and Camella are at Frank Kitts Park, meeting the Wellingtonians! And more than 10,000 Royalists were there to greet them! Me? I was more interested with the solar eclipse, I decided going to work late and drove up to Mt Victoria look out to experience the phenomenon; hoping it will be more exciting than the BORING film ECLIPSE shown on our TV last night!! For those who don't know, Mount Victoria, locally abbreviated to Mt. Vic, is a prominent hill (height 196 metres) to the east of the center of Wellington, New Zealand, and its associated suburb. From Mt. Vic you can have a 360 degree view of Wellington! Why was I there? To photograph the eclipsed sun? I was at Mt Vic to satisfy my curiosity that, if during the eclipse (Wellington only able to witness a partial eclipse) will the sky over the city go darker? So there I was, with my Olympus OM-D + Panasonic 7-14 ultra wide; I took my first shot at 10.23am, manual exposure; 1/320 f8, at 14mm (28 eqv). My plan was to use exactly the same exposure at the same scene, so if more than 76% the sun is "covered" by the moon; the sky should be DARKER? Right? I was there for an hour plus and according to my meter, I DID NOT notice any changes! I was disappointed, took my last shot at 11.05 am and head for the office. 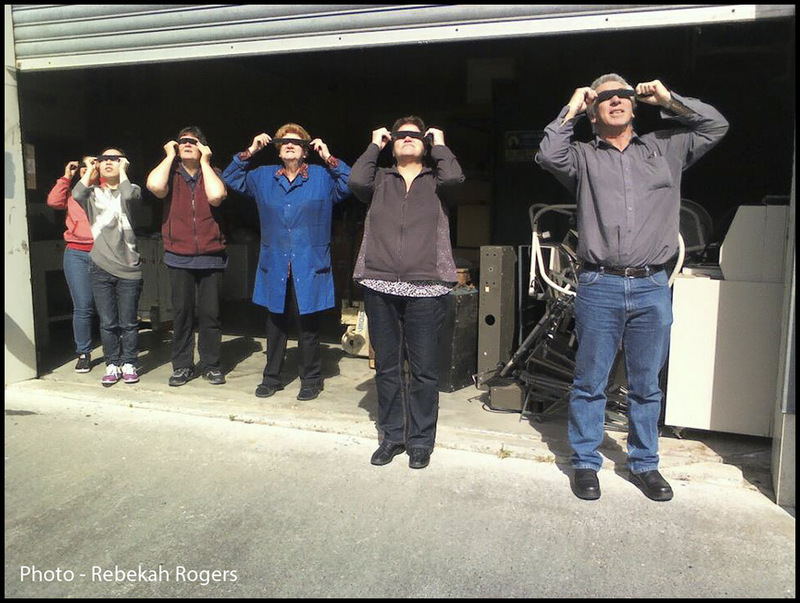 My work colleagues were surprised that I told them the sky DID NOT go darker, because they confirmed it DID at Tawa (where our office is)! When I arrived at Mt Vic and took my first shot at 10.23 am, the eclipse HAS STARTED! Luckily I did some shots after 11 am! As you can see, the sky over Wellington DID went DARKER during the eclipse! HAPPY! (These shots were not Photoshopped ;) Duh! 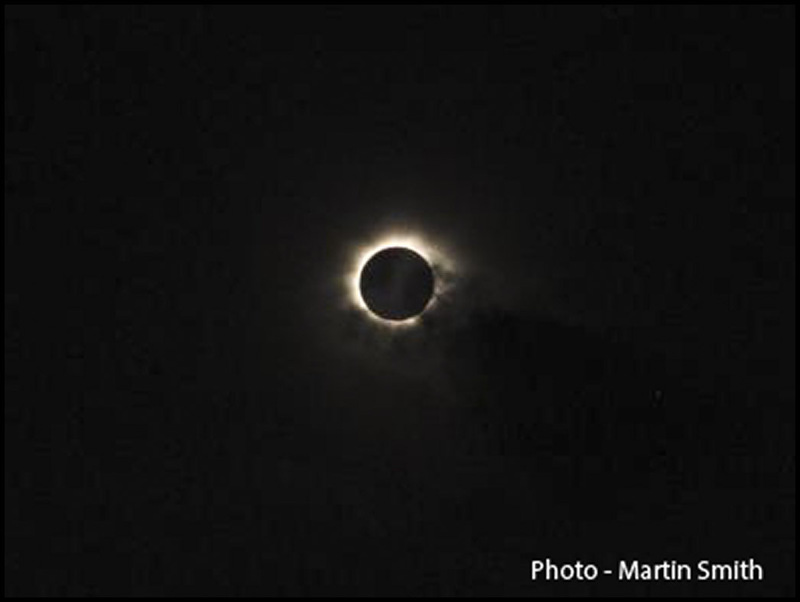 Here are the eclipsed sun shots taken by Simon. Simon told me he shot these with his Canon 60D DSLR with a used Canon EF 100-300 f5.6 lens at 123mm (195mm eqv). He bought the lens on Trade Me for NZ$60.00, YES; SIXTY dollars! To protect the sensor getting fried, he put two layers of exposed processed microfilm, used as filter on the front of the lens. His exposure was ISO 100, f14 and 1/30 on tripod. Personally I think he should have shot at f8 or f5.6, diffraction effect caused by the small aperture will DEGRADE sharpness especially with DSLR. Colleague Heather took this picture with her LG smartphone! My goodness, I cannot believe the incredible QUALITY of this JPEG! Days of Point and Shoot cameras ARE NUMBERED!! You can see Simon's 60D and the cheap but good lens on the tripod. You Can't Beat Wellington On A Good Day! 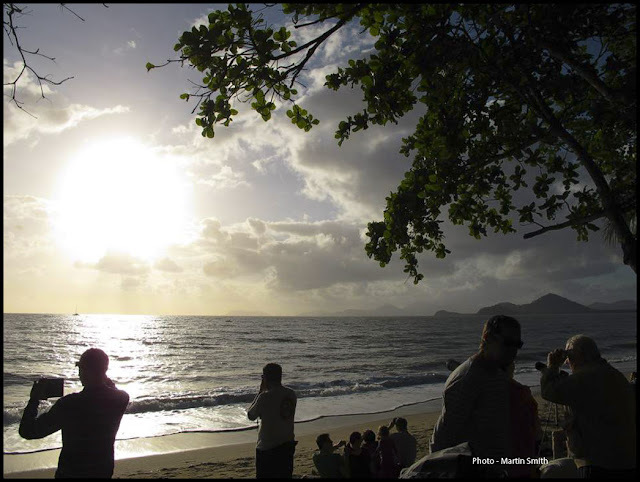 Colleague Martin Smith is at Palm Cove, about 20 min north of Cairns with his family. He posted these pictures! He was shooting with a Canon G12.